Nintendo Download, Sept. 27, 2018: Pew! Pew! Pew! FIFA 19 – FIFA 19 delivers a champion-caliber experience on and off the pitch. Led by the prestigious UEFA Champions League, FIFA 19 offers enhanced gameplay features that allow you to control the pitch in every moment. There are new and unrivaled ways to play, including a new mode in the ever-popular FIFA Ultimate Team and a new Kick-Off mode experience. Champions rise in FIFA 19. FIFA 19 is available on Sept. 28. Mega Man 11 – To save the day, the Blue Bomber must battle Robot Masters and take their powerful weapons, which now changes the hero’s appearance with added levels of detail. The innovative Double Gear system lets you boost Mega Man’s speed and power for an exciting twist on the satisfying gameplay the series is known for. Mega Man 11is available on Oct. 2. 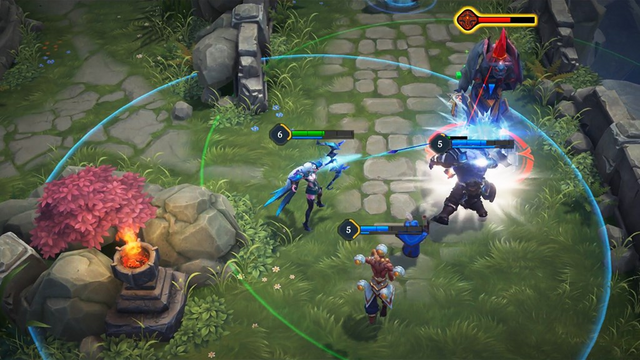 Arena of Valor – Build the ultimate team with your friends to crush your opponents in the first MOBA game on the Nintendo Switch system. Explore and command a roster of more than 39 fearless heroes, with roles including Tank, Assassin, Mage, Support, Warrior and Marksman. Discover and dominate all the gameplay modes, including 5-v-5, 3-v-3, 1-v-1 and a unique “Hook Wars” mode that will challenge your skills and prove your hero as a true champion. DRAGON BALL FighterZ – DRAGON BALL FighterZ is born from what makes the DRAGON BALL series so loved and famous: endless spectacular fights with all-powerful fighters. Partnering with Arc System Works, DRAGON BALL FighterZ maximizes high-end anime graphics and brings easy-to-learn but difficult-to-master fighting gameplay. DRAGON BALL FighterZ is available on Sept. 28. YO-KAI WATCH BLASTERS: Red Cat Corps and YO-KAI WATCH BLASTERS: White Dog Squad – Today marks the release of the free Moon Rabbit Crew update for both the YO-KAI WATCH BLASTERS: Red Cat Corps game and the YO-KAI WATCH BLASTERS: White Dog Squad game for the Nintendo 3DS family of systems. This new content includes more missions, areas to explore, and Big Bosses to befriend. Players will be able to link their save data from YO-KAI WATCH BLASTERS: Red Cat Corps and YO-KAI WATCH BLASTERS: White Dog Squad to get special bonuses. - Nintendo Switch Online – Introducing a new online membership service from Nintendo. With a Nintendo Switch Online membership*, you will get access to online play in compatible games, a growing library of classic NES titles, cloud back up for your save data in compatible games and more. - My Nintendo Quiz & Sweepstakes – Wondering what to play next? Take this quiz for game suggestions, plus while you’re there you can also enter the My Nintendo “Games with an Edge” sweepstakes for a chance to win a HUGE Nintendo Switch prize pack! ** Visit https://www.nintendo.com/switch/games-with-an-edge/ for more info. - Luigi to the Rescue? – Capture those ghosts, then catch these spooky My Nintendo rewards in October! Help poor Luigi survive a night in a haunted house in the Luigi’s Mansion game, now available for pre-purchase on the Nintendo 3DS family of systems. You can also earn Gold Points*** with your pre-purchase of the game. To help celebrate this spooky season, My Nintendo is also offering an October calendar and Halloween-themed wallpapers. For more info, visit https://my.nintendo.com/. - Last Chance for the Xenoblade Chronicles 2 Offer! – We’re continuing the launch celebration of the Xenoblade Chronicles 2: Torna ~ The Golden Country game with two new rewards. You can redeem your points*** for a printable Nintendo Switch box art cover or a wallpaper featuring art from the game. Plus, don’t forget that My Nintendo members get free in-game items for purchasing the Xenoblade Chronicles 2 game by Sept. 30. For more info, please visit https://my.nintendo.com/news/825d87caf3c9077a. ** NO PURCHASE NECESSARY. Void where prohibited. Open to residents of the U.S. and Canada (excluding Quebec) who are a My Nintendo member and at least 13 years old. Promotion begins on 9/21/18 at 11:00 am PT and ends on 10/12/18 at 10:59 am PT for a chance to win. One (1) Grand Prize winner will receive: one (1) Nintendo Switch system, one (1) Home Cinema Projector for Gaming with Short Throw | HT2150ST, one (1) JaeilPLM 100-Inch 2-in-1 Portable Projector Screen, one (1) download code for Splatoon 2, one (1) download code for Splatoon 2: Octo Expansion DLC, one (1) download code for 2,500 V-Bucks for use in Fortnite (game not included) and one (1) download code for Stardew Valley (AVR $1,398.94). Ten (10) First Prize winners will each receive: one (1) Nintendo Switch Pro Controller, one (1) download code for Splatoon 2, one (1) download code for Splatoon 2: Octo Expansion DLC, one (1) download code for 2,500 V-Bucks for use in Fortnite (game not included) and one (1) download code for Stardew Valley (AVR $259.95 each). Total ARV $3,998.44. Winners will be selected at random from all eligible entries. Odds of winning a prize depend on number of eligible entries received. Details and restrictions apply; see Official Rules available at http://nintendo.com/switch/games-with-an-edge/sweepstakes-official-rules/.. Sponsor: Nintendo of America Inc.
*** A Nintendo Account is required to receive and redeem My Nintendo Points. By creating a Nintendo account, user is automatically enrolled in the My Nintendo rewards program, My Nintendo Rewards Points Terms of Service and Conditions apply. https://accounts.nintendo.com/term_point. In addition to video games available at retail stores, Nintendo also offers a variety of content that people can download directly to their systems. Nintendo adds new games weekly to Nintendo eShop, which offers a variety of options for the Nintendo Switch console, the Wii U console and the Nintendo 3DS family of systems. My Nintendo members can earn Gold Points on eligible digital purchases. Already have Gold Points? Redeem them toward your next digital purchase of Nintendo Switch games and DLC on Nintendo eShop, or on discount rewards for select Nintendo 3DS and Wii U software. Visit https://my.nintendo.com/reward_categories for more details.